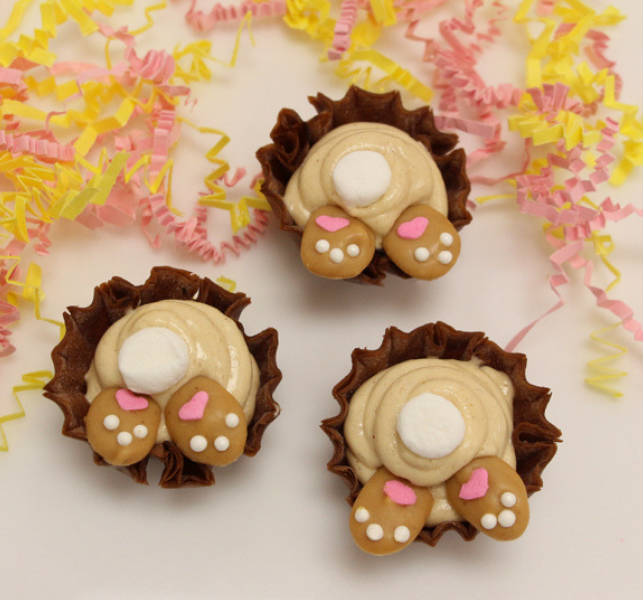 Nobunny will be able to resist these sweet, springtime treats! We took our chocolate flavored phyllo shells and filled them with a rich peanut butter mixture and toppings to create the ultimate Easter dessert. In a medium mixing bowl, combine peanut butter and cream cheese until light and fluffy with an electric mixer. With the mixer on low speed, alternate adding the Cool Whip and confectioners sugar, finishing with the Cool Whip. Chill mixture while you make the feet. 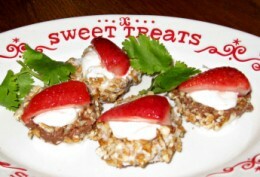 Melt peanut butter chips and white candy melts, mixing together, in a double boiler. Transfer melted mixture to a squeeze bottle with small round tip. Line a baking sheet with waxed paper. Using the squeeze bottle, draw small ovals, ½ – ¾” long, of melted peanut butter mixture on waxed paper. Working quickly, place 1 heart towards the center of the ovals and place 3 round white sprinkles above the point of the heart near the edge of oval. Make the ovals just a few at a time or they will harden before the sprinkles are put on. To keep the squeeze bottle from hardening, place the bottle in a small cup of hot water when not in use. 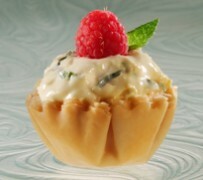 Spoon or pipe peanut butter cream mixture into shells to form rear of the “bunny”. Gently press a marshmallow half on top, center and insert slightly two bunny feet. Serve immediately or freeze and serve frozen. Can be stored for 2 weeks in the freezer in an airtight container. Serve directly from freezer.